Moisturizing, rich-lathering, sulfate-free and bio-degradable, Pacifica Natural Soaps are handmade soaps with a proprietary vegetable-glycerin base, herbs and Pacifica`s signature perfume blends with essential and natural oils. Precious and innocent in French Lilac, these are fresh, invigorating and clean. 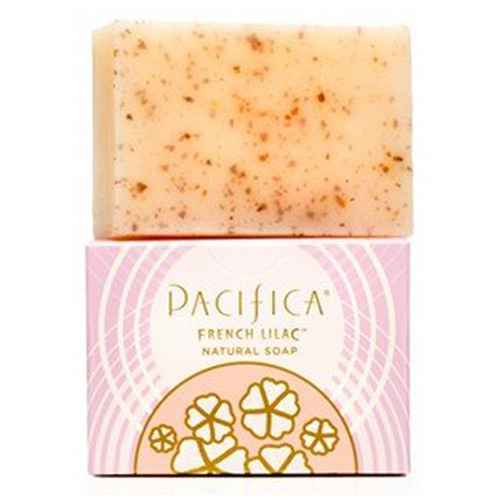 Pacifica’s French Lilac Natural Soap is handmade using a proprietary biodegradable, vegan, vegetable oil and glycerin soap base, ground almond meal, and Pacifica’s own fragrance blend including ylang ylang, oakmoss and heliotrope essential oil. No parabens, animal testing, animal ingredients or artificial colours. 100% VEGAN and Gluten-free. Below are reviews of Pacifica Bar Soap French Lilac - 170g by bodykind customers. If you have tried this product we'd love to hear what you think so please leave a review. Pacifica Bar Soap French Lilac - 170g - Perfumed in a traditional French style, this fresh scent conjures spring with a blend of Lilac, Magnolia Leaves, Heliotrope, Ylang Ylang, Hyacinth and subtle notes of Nectarine. 100% vegan.